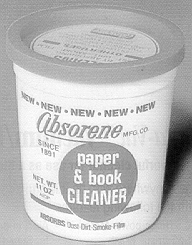 Book and Print Cleaner: Absorene Book and Print Cleaner is a soft and pliable putty like material that looks and feels just like "play-dough". Chamois Cloth: Imported from Italy, our genuine sheepskin chamois is a great cloth for cleaning, drying, dusting, polishing and much more. Design Art Gum Erasers: This unique formula doubles as a non-abrasive eraser and a dry cleaner. Ground Eraser Powder & Pads: Ground eraser powder is recommended for cleaning dirty paper but also works well on books, leather, cloth and much more. Kneaded Rubber Erasers: Kneads into any shape. Removes marks cleanly and leaves surfaces smooth and bright. Mars Cordless Erasing Machine: The Staedtler/Mars cordless rechargeable erasing machine can be used for cleaning small delicate areas and for larger jobs too. Pink Pearl Eraser: Famous the world over for its exceptional erasing qualities, Pink Pearl erasers are soft and pliable and are self cleaning every time it's used. 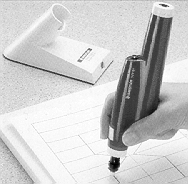 Rubber Cement Pick-Up Eraser: The Best-Test pick-up eraser adheres to dried and tacky adhesives allowing for easy removal of excess adhesive. Sold by the each and dozen. 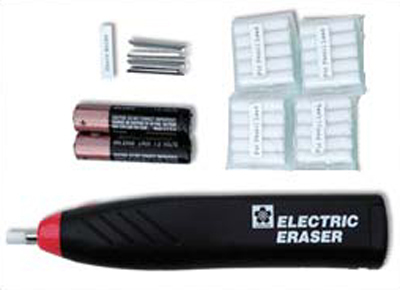 Sakura Electric Eraser: The Sakura electric eraser weighs in at only 2.6 ounces. Staedtler Mars Plastic Eraser Pencil: This Staedtler Mars eraser is made of the same white vinyl eraser that comes in the block form; only it is in the form of a rod that fits into a pencil type holder. Staedtler Mars Plastic Erasers: This white vinyl eraser cleans without leaving a ghost area on papers and films.